JUNK SHOT! App Co-Founders, Fred Tomlin and Sherrod Hunter along side USF President, Dr. Judy Genshaft. USF Alumni and Co-Founder of AWS/JUNK SHOT App, Fred Tomlin was the company’s award recipient. Fred, a 2004 USF graduate with a Bachelors Degree in Advertising & Marketing, is the AWS Director of Business Development. “We’re excited about this phase of growth for the company”. “And enjoying the focus that comes with building an A-Class Team to better serve our clients”. “We take profitability serious, and to be recognized for growing profits 3 years in a row, is a great pat on the back for our Team”, says Fred Tomlin. 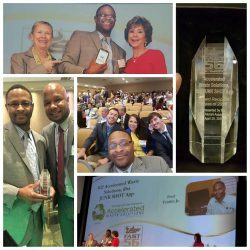 Founded in 2010, Accelerated Waste Solutions is a Tech-Waste Firm, pioneering the USA’s 1st and Only, patent-pending Junk Removal App, “JUNK SHOT!”. This proprietary app allows smartphone users to capture and send photos/video of their unwanted junk/trash for a Fast, Free Quote & Pickup Time. AWS is also a national leader in 5-Night-A-Week, Apartment Doorstep Trash & Recycling Collection, developing innovative technologies like, “DOORSTEP DETAILS” Trash Collection Reporting systems. AWS/JUNK SHOT operates services reliably in 11 States for over 10,000 Residents every single day!